Trivandrum, or Thiruvananthapuram, is the capital of the Indian state of Kerala. It is located on the extreme south of the west coast of India, sandwiched between the Arabian Sea and Western Ghats, giving it a unique tropical climatic condition. The old fort town of Trivandrum stands amidst a vivid landscape. It was ruled by the Travancore Dynasty before the independence and was a trading post for spices, sandalwood and ivory. The city has historically been a cultural hub in South India due to the active interest of the rulers in the development of arts, architecture and liberal customs. Many of these Kerala traditional architectural marvels still remain amidst the urbanizing town. The most iconic structure of the old city is the Padmanabhaswamy Temple, laid out along the central axis of the fort. Its entrance is marked by the towering gopuram (gateway), a mix of Kerala architecture style and Dravidian style imbibed from the neighbouring state of Tamil Nadu. It is an important festival route and religious destination for the people of Trivandrum and the main axial street is always vibrant with pilgrims and religious activity. 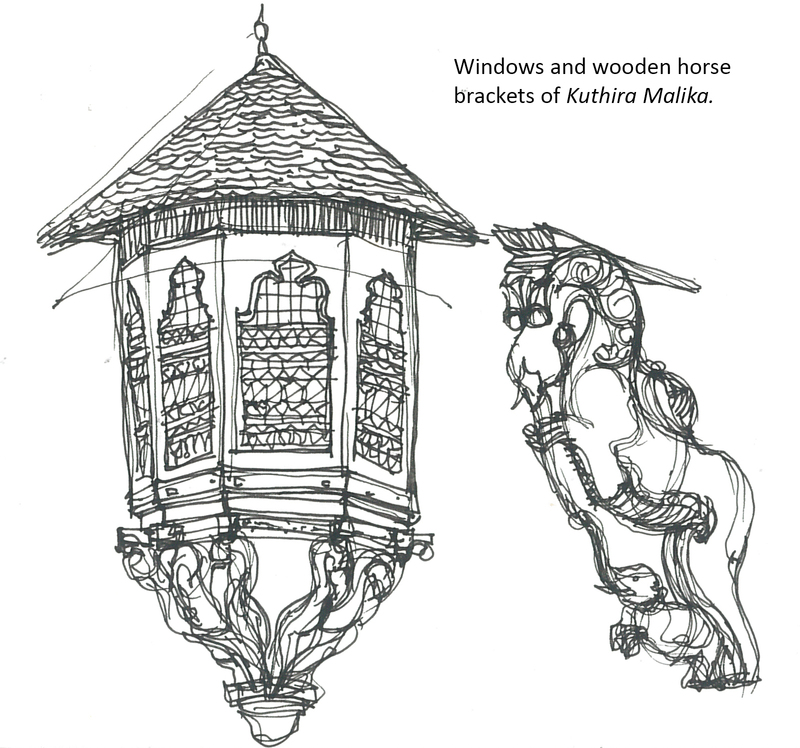 On the south-eastern side of the Padmanabhaswamy temple lies the Kuthira Malika (Mansion of Horses). Built in the 1840s, Kuthira Malika is an example of traditional Kerala architecture, with its typical sloping roofs, overhanging eaves, pillared verandahs and enclosed courtyards. The palace gets its name from the 122 horses that are carved into the wooden wall brackets that support the southern roof. Now it is used as a museum of Travancore Heritage and a venue to host many musical festivals. 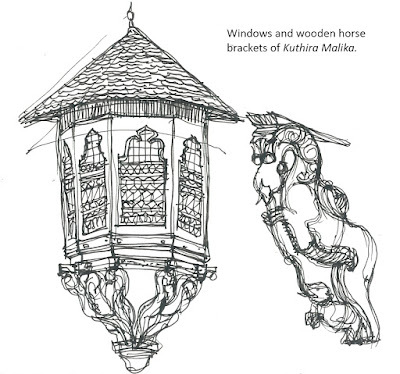 The Methan Mani (Clock Tower) is also a part of the Kuthira Malika, which served as an important landmark for the city. Above the dial is the face of a bearded man with two rams on the side of his cheeks. When the clock strikes, the rams hit the cheeks of the man. Around the fort complex lie the agraharams or the residences of the Brahmins, who were brought by the Travancore from the neighbouring state of Tamil Nadu to serve as priests in the temple. A typical agraharam consists of row houses with sloping roofs and common walls lining a street. The planning of an agraharam is dictated by the temple which forms the focal point of the colony. The streets are aligned east-west with the row houses clustered along either side. The backyards of the houses are linked by narrow lanes. The streets in front of the houses transform into an active community space serving as a commercial space for vendors, a play area for children, a meeting place for elders, and venues for religious processions and meetings. However, over the years, the heritage buildings have become the victims of urbanisation and modern architectural trends. Another important landmark is the Napier Museum, which is a cultural place for art and crafts occupying a large scenic landscape in the heart of the city. It was built in the 1840s by the Travancore king. It is an example of Indo-Saracenic architecture started by the British, featured through its gothic roofs and minarets. It also serves as a major open space for the city, always active with visitors, joggers, history buffs, students, art and craft lovers, etc. Palayam is one of the busiest places in Trivandrum and one of the oldest camp grounds of the Nair Pattalam, the royal army of Travancore kings. At Palayam, one can witness a rare site of religious integration, with the Palayam Juma Mosque, St. Joseph’s Cathedral or Palayam Palli and a temple situated close to each other. Trivandrum is also famous for the architectural works of Laurie Baker, renowned for his initiatives in cost-effective sustainable architecture and designs that maximized space, ventilation and light. The Loyola Chapel reflects Baker’s mastery over light. The last one is a fishing harbor from the neighbouring town of Kollam. It was a part of the old port. It is a very active fish market with a fishing community living beside it. The beach is made colourful with the fishing boats which dock there after the trips to the sea. 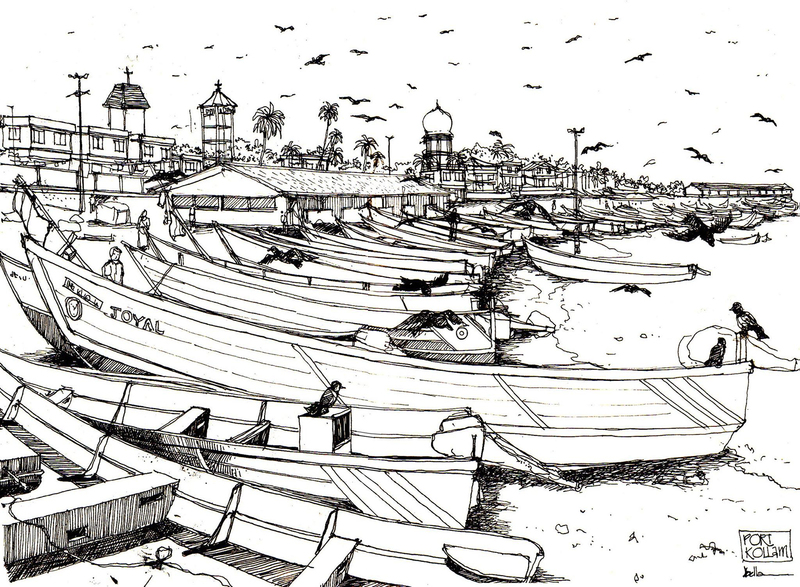 Bella Ullas is an architect and urban design student from Kochi, Kerala. She is a part of the Sketch and Walk group from Trivandrum.